Back in April 1979, I met a slight old man who had suffered a stroke and spoke in a halting, somewhat slurred voice. I am embarrassed to say that I have only a vague recollection of the circumstances of my introduction to the old gentleman. I think I was told that he was an important person in the early history of aikido. I didn’t know anything about him really when I went to visit him at his home in Nakano Ward in Tokyo. The man’s name was Takuma Hisa. I must say he was a charming person, and he kept attempting to speak to me in English. I appreciated this because my Japanese was not very strong at that time, but it made the conversation tediously slow. Little by little, I was able to piece together that he had been a student of Morihei Ueshiba first, and then Sokaku Takeda, at the Asahi News dojo in Osaka. Having learned this, I began to sense that perhaps this man might have played some important role in the early evolution of aikido. Toward the end of our conversation, he began to sing me a song. I remember the introductory words very well: “You came, you came, you really came…” He really like me, but I don’t exactly know why because I wasn’t knowledgeable enough to ask very intelligent questions at this early stage of my research. Perhaps it was simply the fact that I was a foreigner, a journalist of sorts, and had shown interest in an aspect of his younger years that was very important to him at this final stage of his life. After our first meaning, he began to write me regularly in broken English. He sent me the newsletters that he was publishing, and one of them mentioned my name and the fact that I had visited him at his home. Soon after this, something dramatic happened. In our conversation, Hisa Sensei mentioned an old film of Morihei Ueshiba that was shot before the war. I knew of the existence of this film and desperately wanted to see it. A friend of mine did some research and located a film from the prewar period that might possibly be the footage I was looking for. I went to a film archive facility in Tokyo where a special viewing had been arranged for me. As the projectionist prepared the film, I became very nervous in anticipation. Then the first image flashed on the screen with the title “Budo.” I felt my heart sink because there was no mention of anything related to “Aiki”. Resigned, I thought that, still it would be interesting to see this prewar “talkie” film because it might contain footage of some important martial artist. Then it happened. I saw a small, yet sturdily built middle-aged man walk on to the screen. He had a big mustache and a strong physical presence about him. It was Morihei Ueshiba at age 51! I immediately felt tears well up in my eyes, which was very embarrassing. Fortunately, the room was dark and the fellow showing the film did not notice anything. Then another man, much larger and very powerful looking appeared on the screen. He was obviously the leader of the group. He sat down in seiza and opened a scroll and began reading in a loud voice. This was Takuma Hisa, the little old disabled man I had met only a few weeks before! I was an emotional wreck but so very happy at that moment. And then the action started! My God, Morihei put on a fantastic display. Strong, but elegant technique, applied with a palpable, dynamic energy. And the finale was breathtaking! In any event, I called Hisa Sensei and told him about my discovery. He was overjoyed because he had never seen this film made way back in 1935. 44 years had elapsed! I really felt that I had to arrange a showing for him. So I contacted Shigemi Yonekawa — the man who is Morihei Ueshiba’s uke in the Noma Dojo photos — whom I had recently interviewed and who appears prominently in the 1935 film. We set up a date to travel to Hisa Sensei’s home for the private showing. Yonekawa Sensei, a very reserved man by nature, was obviously most pleased. Fortunately, I had lugged over to Japan a heavy old 16mm movie projector when I moved there in 1977. Armed with my projector, I met Yonekawa Sensei at Tsuchiura Station on the Joban Line and we rode the train down to Tokyo, and then out to Nakano to Hisa Sensei’s house. Neither Hisa nor Yonekawa had seen each other since before the war. I was so happy to see the two of them united after so many years. I could kick myself now for not taking photos and recording the conversation, but I was young and green as a researcher, and had my hands full as the projectionist. I finally got everything to work including the sound, and the film started. Hisa Sensei immediately started to cry tears of joy! I became emotional too, but once again, the darkened room came to my rescue. Sensei started giving a commentary on the film in a slow, but animated voice. It was altogether an unforgettable moment, and one of the highlights of my research career in Japan. 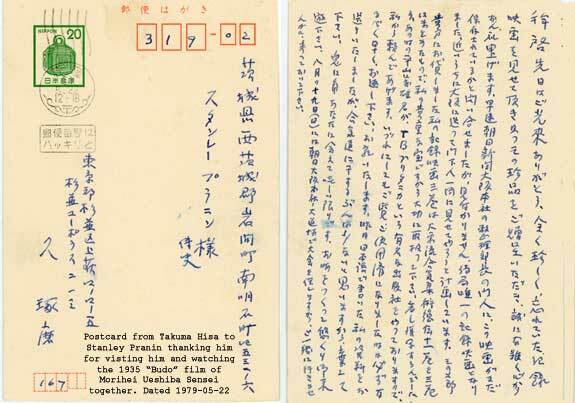 After the film showing, the steady stream of letters and documents from Hisa Sensei continued. Then one day a package showed up at my door. It contained four boxes of microfilm. I opened the boxes and — not having access to a microfilm viewer — pulled out a strip and held it up to the light. The package was from Hisa Sensei and the microfilm contained image after image of jujutsu techniques. I could tell that neither Morihei nor Hisa were in the photos, and I really had no basis to evaluate what these photos were or their importance. Much later, I Iearned that Hisa Sensei had sent me the entire “Soden” collection of the Takumakai, the Daito-ryu organization set up around him after the war. There are over a thousand images documenting the techniques taught by both Morihei Ueshiba and Sokaku Takeda at the Asahi News dojo over a period of six years from 1933-1939. A true treasure whose significance I was only able to appreciate many years later. 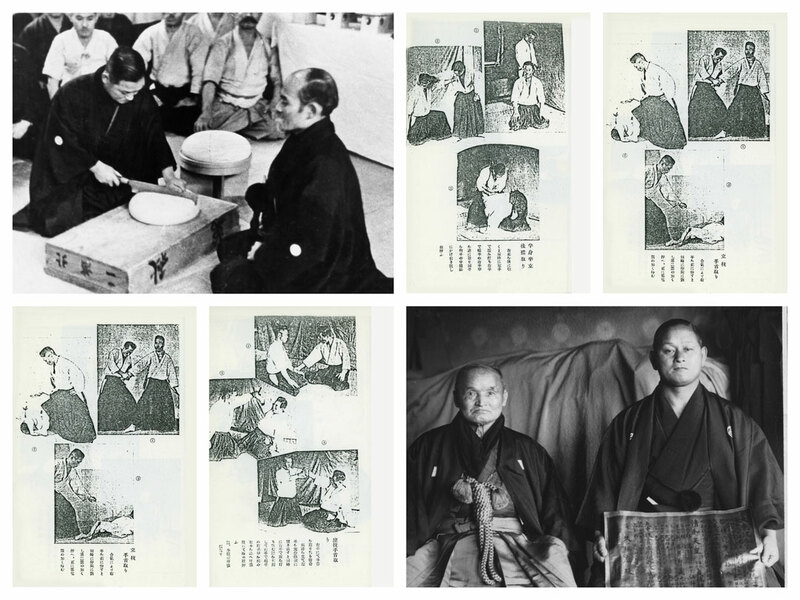 A collage with photos of Hisa with Morihei Ueshiba, Sokaku Takeda, and samples of the “Soden”. 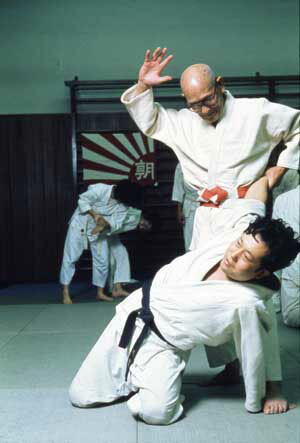 I saw Hisa Sensei only one time after that at the 1980 All-Japan Aikido Demonstration. He passed away in October of the same year. Only later after researching Daito-ryu Aikijujutsu and Sokaku Takeda was I able to appreciate Takuma Hisa Sensei’s important place in aikido history. Forgive the rather lengthy introduction to today’s historical photo. Here you see the dynamic Takuma Hisa executing a Daito-ryu projection technique sometime in the late 1930s in Osaka. The imprint of Morihei’s instruction is readily apparent in this beautiful photo. 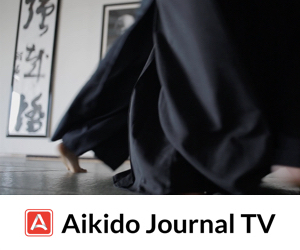 Watch scenes from the 1935 Asahi News film with Morihei Ueshiba and Takuma Hisa now on Aikido Journal TV. Thank you so much…your ongoing work in obtaining, documenting and retrieving history is such a gift to us all. Thanks for the words of encouragement, Janet. I’ll continue putting all of this stuff up as long as I’m able to move. It will take decades! Stan, I always got good vibes about Takuma Hisa, confirmed here. This narrative displays remarkable detective work in place finding “lost” items that will make all the difference historically as does all your work. I’m not sure if the average person can grasp the immensity of what you have achieved and what are doing Stan, but it sure is appreciated in some circles. Thank you for sharing this wonderful story !!! Mr Pranin, this is truly Amazing! Thank you for all your efforts. The truth………… It is truly refreshing. I have only been a subscriber a couple of years, but in that time I have read pretty much all there is to read on Aikido journal. I also go back and re-read some of my favourites to keep my inspiration up! All the little pieces add up eventually to one big piece, this information on Hisa Sensei, is also in my opinion highly important. This stills that you propose to publish, may even turn out to be explosive. What I mean by this, it will be interesting to compare these techniques with Saito sensei. The reason I say this is because, in the famous “Budo” film, the students can be seen using warming up exercises, and in a documentary shot in Iwama Saito sensei can be seen using the very same techniques, and the narrator descibes them as Aiki gymnastics. I believe Stan we have discussed this small point before? Now wouldn’t it be interesting to see if the unpublished stills are anything like the techniques that Saito Sensei Demonstrates? 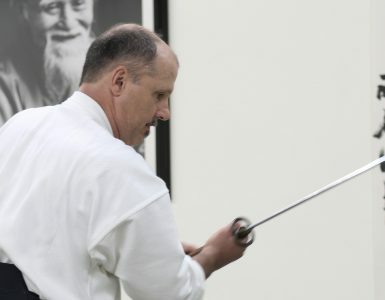 I was having a discussion at our Dojo on Thursday night, and I now understand how woefully equipped, a lot of teachers are, as regards to the history of Aikido, and where what we do comes from. So I finished a 20 min briefing you could call it, and closed with telling all the students to visit Aikido journal for the true facts of Aikido History, some didn’t even know what Daito Ryu was? 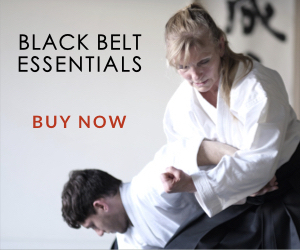 I will continue to support the immensely important work at Aikido Journal by being a subscriber and purchasing the odd book and DVD, and in any other way I can serve to help. Thank you for your most interesting perspective and support of our activities. I can only echo what Nev and Janet have said: an adequate value simply cannot be placed on your protracted and extensive research in to the art we all love. Thank you, Stan! It all unfolded naturally and without a plan, at least in the beginning. Later, I realized the importance of what was happening. I just could never understand why more people weren’t interested in delving into aikido’s history. It is truly epic in proportion! As always, Sensei, I appreciate your efforts without which we would have nothing but badly transmitted oral traditions. 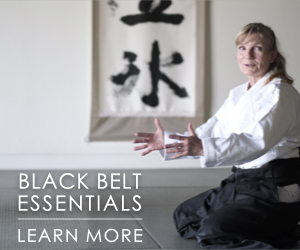 This is a great tribute to Aikido, although I do not study Aikido I think it’s an unbelievable resource for my Hapkido training. 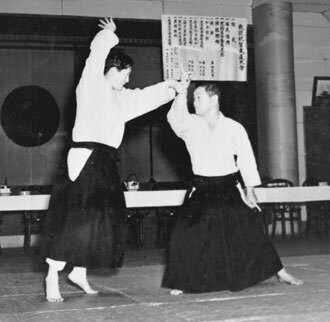 As you may know Hapkido was developed from Daito Ryu by a Korean (Young Sool Choi) who lived with the Daito Ryu founder before and during WWII. I was stationed in Misawa, Japan from January 1980 to July 1981. I wanted to stay in Japan but the Navy felt otherwise and I was transferred back to the states. I look forward to receiving the daily Aikido Journal and all of the great stories and technical information. I have actually improved some of my techniques by watching some of the great Masters on the videos that I have downloaded. Thanks again. Thank you, Tony, for participating in our discussion. I am encouraged by Tony Ramey who is interested from a Hapkido standpoint. I took 6 months of Aikido in 1967. Then life intervened. Over the last 16 years I started training Hapkido seriously. I have enjoyed it and am very interested in the connection to Daito-Ryu and the non-incidental sharing of the Chinese characters (and some fundamental meaning) between the names of Aikido and Hapkido. Now, late in life, I have started to train Aikido again. The similarities to HKD are there, even only if obvious after the fact. Rather like French and Italian. I have always taken interest in what technical and mechanical efficiencies I could exploit in Hapkido, as I am not a powerfully built person; in that vein, I have always observed that women, who obviously cannot power through a poorly performed technique as strong males often do, are generally much more astute and precise learners of HKD technique than men. While I have fully enjoyed my HKD career, the subtlety and flowing grace I am starting to learn in my fledgling progress in Aikido is truly a delight, as is the intriguing moral philosophy underlying O-Sensei’s vision of Aikido. My tolerance to joint locks and similar pain, and the ability to fall safely (from jumps and throws in HKD) is a huge advantage at my age, and I can train with complete abandon. But to come back to the intertwining historical threads that the editor has preserved/rediscovered and traced back to the sources of the various influences of our art, this is an incredible treasure trove that must not be lost! Please count me as a strong supporter, Stan! Oldie; Thank you for the kind words. I was looking around the internet and came back to this site and I read what you wrote and I sincerely appreciate the compliment. You are a little bit older than me I think, I was born in November 1959. I started Judo in 1972 and over the next 40 years I acquired a lot of knowledge from Shorin Ryu Karate and Hapkido. HKD became my choice of styles mainly due to the Billy Jack movies and how Bong Soo Han used HKD to defeat the foes in the movie. Anyway, take care and I hope your training and heath continues to blossom. 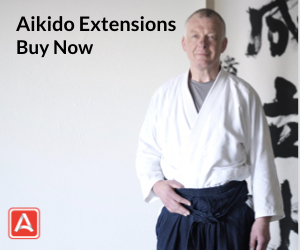 In a edition of aikido journal, you refer to a interview of takuma hisa not published. You justified that the opinions of hisa above Sensei was much unfavorable. I believe in the importancy of know all sides above Sensei. This interview was published in another occasion? 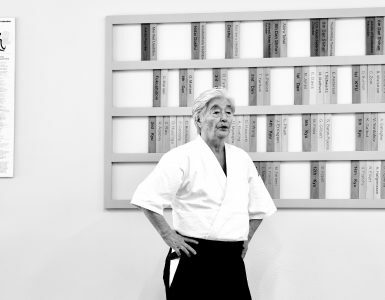 That collection of photographs is a precious resource both for Daito-Ryu and Aikido. Have you put it online to make it available for everybody? Stan, elsewhere you have written tha O Sensei made a technical revolution to Daito Ryu. Could you, perhaps, write us an article (or republish it if you have already written one) spelling out the nature of that revolution and the key differences between Aikido and Daito-Ryu? What happened with the Soden microfilm? Was it ever digitized? Could it be made available to the public? Great, that and the Noma dojo pictures. I would put them both in the same package, after all they do represent the Daito ryu/AikiBudo era of O’Sensei. So valuable to have access to this historical reasearch and original documents of such importance. Thanks for sharing all this wonderful work.